There is something magical about visiting the beautiful state of Florida and I am not talking about visiting Mickey Mouse at Disney World. Personally, been there, done that. What I am talking about is visiting all of the beautiful coastal areas that Florida has to offer...one of them being South Beach in Miami! I wanted to bring to your attention the newest addition to South Beach for the summer. 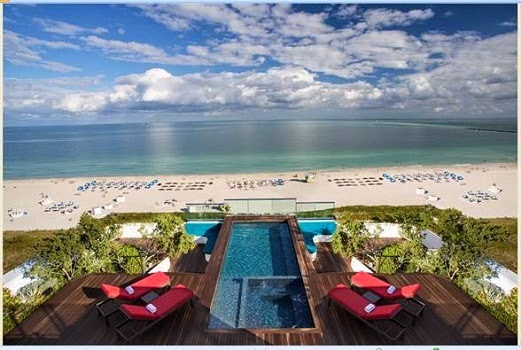 The Hilton Bentley on South Beach introduces newly renovated 3000 sq. ft. It's fine luxury at it's best!!! 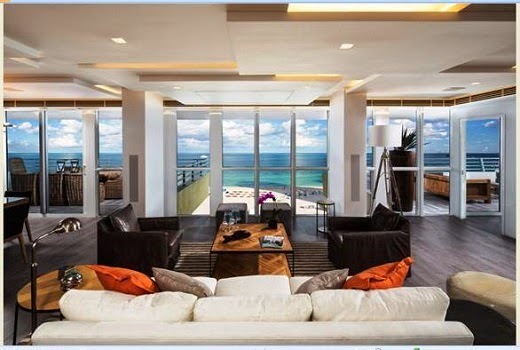 This two story 2/3, two master bedrooms and 3 full bathrooms, makes any stay as classy and upscale as South Beach gets. A full stainless steel kitchen, with personal wine chiller, elegant dining room, living room with 60 inch retractable LED television, and marble bathrooms, accentuate the refined interior. Two private terraces, a rooftop heated jacuzzi and a pool deck provide all the breathtaking views one could imagine. No matter where you occupy your 3000 sq. ft., you can hear the Dolby surround sound system, while controlling it and everything else in your suite from your iPhone or iPad. With rates ranging from $2,500-$7500, this Hilton Bentley suite is worthy of occupancy any time of year. If you are looking to vacation in the lap of luxury with all modern conveniences and breath-taking views in South Beach...the Hilton Bentley South Beach - Miami is the place to be! You can check out their web site for additional information, amenities and availability.